Last week, I was in shorts. It is fair to say I got a few strange looks from the locals. A few old people shivered and drew their coats up around their necks as they passed me, but it was 22c and for me that’s summer. That was last week though. The temperature has dropped significantly and winter has rocked up, shocking us to the core. Most Sicilians now look like they are about to go on an expedition to the Artic. It surprises me how many winter clothes they have, considering they get such a relatively short winter. Like it or not, old ladies are wearing fur which has passed down generations, mind you, I have seen fur coats being worn when it is 20c. The best thing about this cold snap? Snow. Snow has turned parts of Sicily into a winter wonderland, especially in the Madonie mountians and on Mt Etna. Schools have closed and everyone is grappling with snow chains or rushing to buy them. Avid skiers are looking for news as to when the ski runs will open. It is exciting that you can ski on an active volcano while marvelling at views of the sea in the distance. 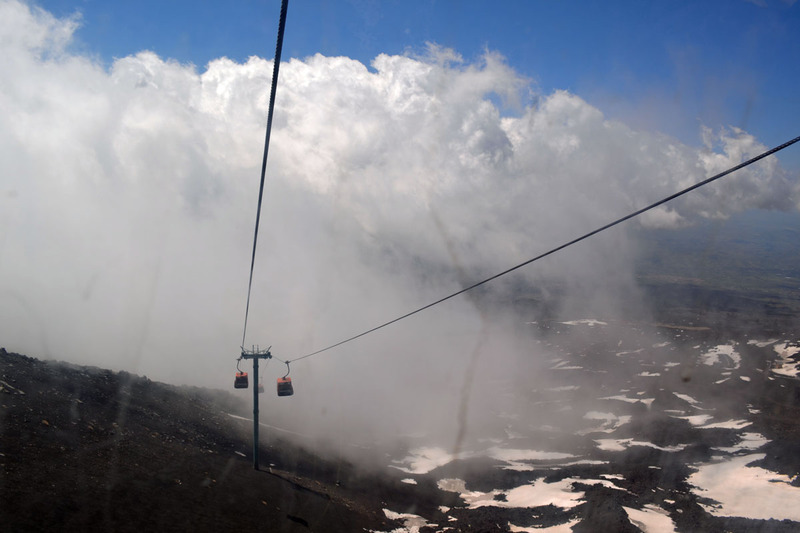 It is also quite scary, not just that the volcano could erupt at any time but also when you are up there it looks as though you are going to ski right off the edge into oblivion! But if that’s not for you then there are other places to ski in Sicily, such as the Madonie Mountains at Piano Battaglia. If you want to know when the slopes are open then you can check out www.pianobattaglia.it and Etnasci.it. And if skiing isn’t your thing, then you can partake in the popular pastime of Catanese and drive up to Etna, pile a load of snow onto your car bonnet and drive down the mountain and see how long it takes for it to melt! The thing about living in Sicily is that there is so much to discover, yet only a few people seem to be ‘in the know’. So much potential, tourism-wise, is just wasted, ruined even. Take the Salinelle di Paterno, for example! Little exploding mud volcanoes in other countries are made into tourist attractions. They are nature’s little wonders. They are to there to be seen, admired and wondered at. You don’t have to be a vulcanologist to be excited by them. In Paterno, on the slopes on Etna, their beauty, their fascination is lost on the locals who seem to view it as a place to dump their rubbish. People have tried to make it an attraction. The Inner Wheel Club of Paterno erected a detailed information sign in 2014. However, if you went there today you would see rubbish strewn around it. It is located next to an abandoned and vandalised stadium which probably should never have been built there in the first place. You can peer through the fence and glimpse the mud spurting from the ground like we did but the rubbish is off-putting and you really feel let down by the whole experience. Many of my students are unaware of their existence even though they made the local news the other day with new explosions splashing mud all over cars and a mud river running, or should I say, slowly moving down the street (see link to article here). About one week after Etna’s last eruption we decided to hike up Mount Zoccolaro to get a good view of the Valle del Bove into which the lava rivers were flowing. This was our third attempt at the trail. The first time, we had had to turn around near to the top as it was lunchtime and you don’t keep the ‘in-laws’ waiting. The second time, we were both recovering from the flu and had tried to hike too soon. It is not that the trail is particularly long, it is only about 1.5km. It is more a case of it all being uphill and quite steep at times. It is a beautiful walk and fortunately there is lots of shade at the start which was definitely needed this time round. It starts off along an apple orchard before entering into a wooded area of beech trees. There are two noticeably large trees which countless people have carved their names into. The trail can be slippery at times especially if there is a fresh covering of ash from an eruption and you do have to watch out for tree roots. As it was summer there was quite a lot of undergrowth that was quite tall in places and there were plenty of wildflowers to see along the way. There are plenty of viewpoints along the way to spur you on and to give you an excuse for a pit-stop. On the last part of the trail we had to scramble up a bit of rock as the path wasn’t very clear but this time we got to the top and the view was breathtaking. We could make out the lava flows from the recent eruption and we could see the whole of the Valle del Bove, a black, lava strewn expanse (in fact, it is 37sq km). Just as my partner was saying that Etna had gone quite again she started grumbling rather loudly and I felt a little bit too close to danger. She continued to grumble the whole time we were up there and from time to time we could see plumes of smoke being blown out of the New South East Crater. I am not sure how long they will call it the New South East Crater. It was formed a few years ago when does it lose its ‘new’ status? When you look down into the Valle de Bove you see so many different shapes and cracks made by different lava flows. Nothing seems to be growing there and it is difficult to gauge the size of the cracks that you see. I have looked down into the Valle de Bove from above but this view far outstrips that one and really enforces the magnificence of Etna. 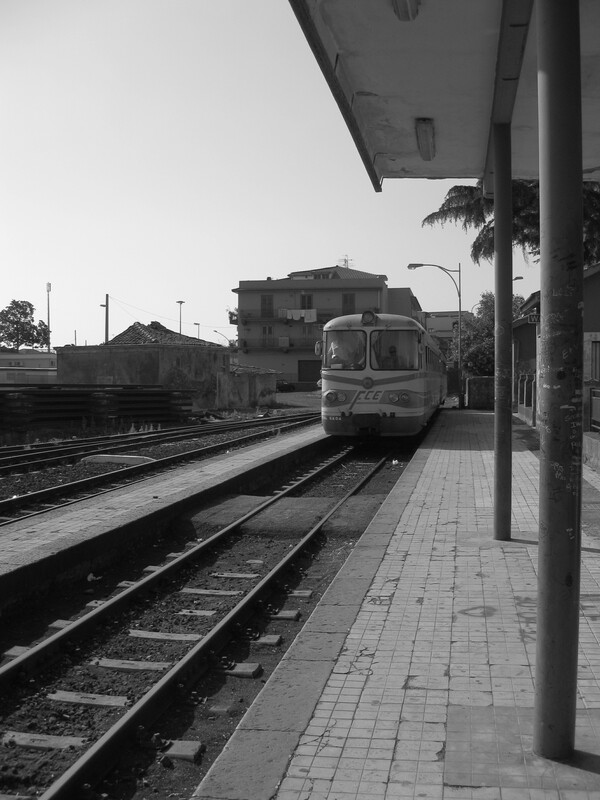 After looking at the view for ages and nervously jumping every time we heard a boom from the grumpy one we took advantage of a nearby platform and sat and had a picnic of chicken and chips which we had picked up in nearby Zafferana Etnea. Although I didn’t really eat much despite being rather famished, probably because I kept looking in awe around me. It would seem that we weren’t the only hungry ones on the mountain. Not long after we had finished our picnic, I saw a fox appear from the bushes. It ignored us at first. It had spotted something living in a hole nearby and it set about furiously digging until it had managed to get the small reptile. It then noticed us, or at least smelt our chicken, and started to come closer. Not sure why but I didn’t feel comfortable with this, foxes can look quite menacing and I am not used to one coming so close, so fearless. Therefore, we took our smelly chicken and headed off back down the mountain. On our way we met a German family who we warned about the fox as they had young children who were looking rather hot and bothered. It turns out that was one of the reasons they had taken the trail. It appears that they had been told of a ‘friendly’ fox who lived on the trail by the owner of their B&B. The fact that the fox was up there spurred them on. It is not the first wild animal that we have seen on that trail. 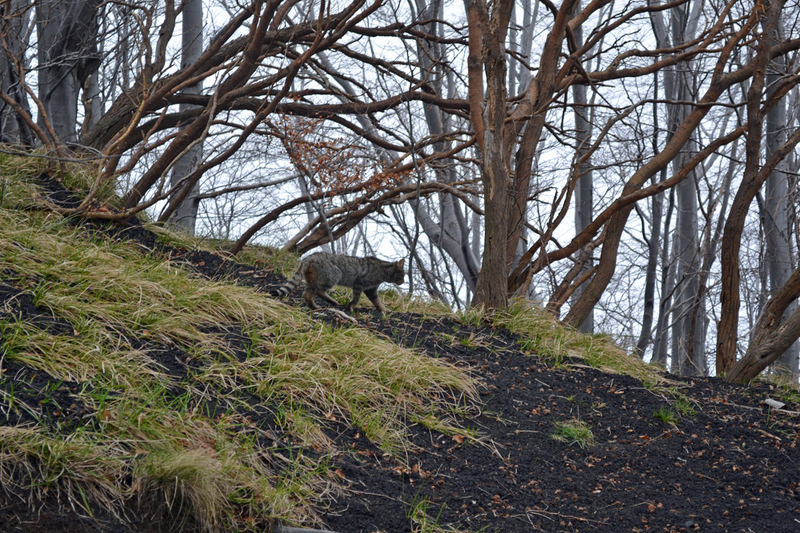 Previously we had encountered a mountain cat which had quietly but calmly walked right past us. Not sure if the cat would ever attack the fox or vice versa if hungry, would definitely be concerned for any cubs. The way back down is harsh on the knees but it is definitely a walk that I will do again, especially next time Etna erupts! I have been waiting for Etna to erupt ever since moving back to Sicily, she has been so quiet lately, yet in 2013 she didn’t seem to stop erupting. My partner came out here before me and kept ringing me to tell me about her activity in December 2013 and January 2014. At one point he said that the windows were shaking and his mother was praying and that she had never sounded so loud. Back in England I felt like I was missing out. Why would I want the volcano that I live at the foot of to erupt? Well, that’s a good question and one that years ago I would have asked myself. When I did my Geography degree and studied disaster zone management I couldn’t understand why anyone would choose to live in a disaster prone area but here I am living beneath (actually sort of on) a volcano and in an area that experiences earthquakes. I have seen Mt Etna erupt before and each time I have to blink and check that it’s real. You can’t fail to be impressed by a display of nature’s great power. Volcanoes create and destroy, whilst their lava flows can claim land and houses they in turn create rich fertile land. Etna has vineyards on its lower slopes and orchards of apples and pears higher up. 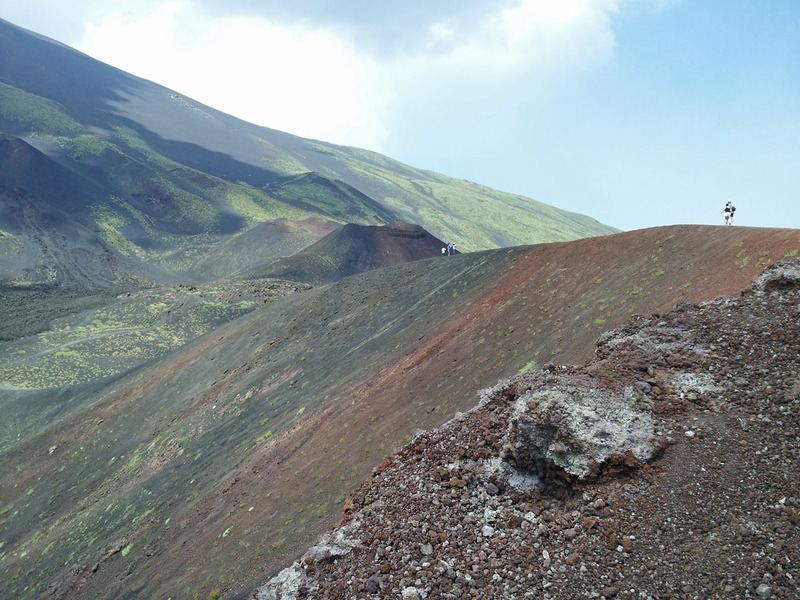 Etna makes you aware of your own mortality and makes you appreciate your very existence here on earth. I think living with an active volcano explains why many people here seem to live dangerously and without a care. They have a saying ‘In bocca al lupo’ which means in the mouth of the wolf – our fate lies in the hands of others. 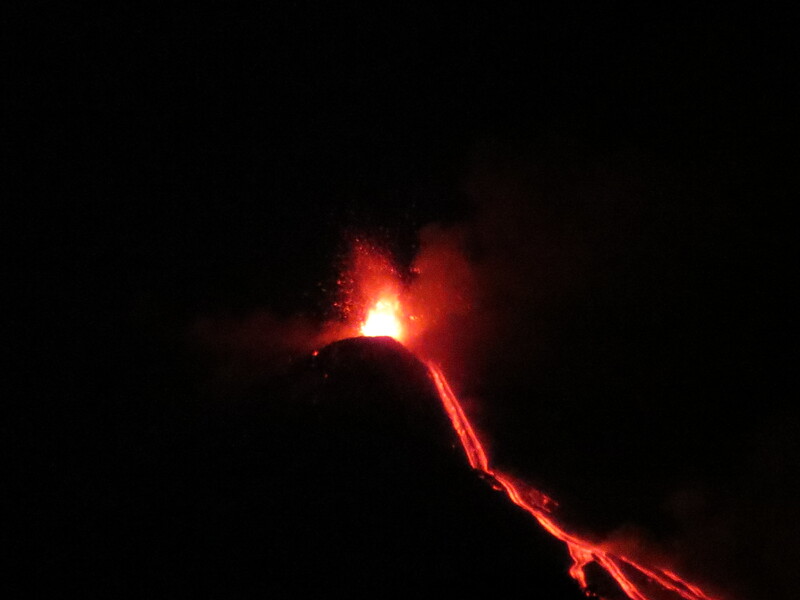 On Sunday night, June 15th, after slight strombolian activity from it’s new south east crater in the preceding days, Etna’s activity increased and she put on one hell of a show. 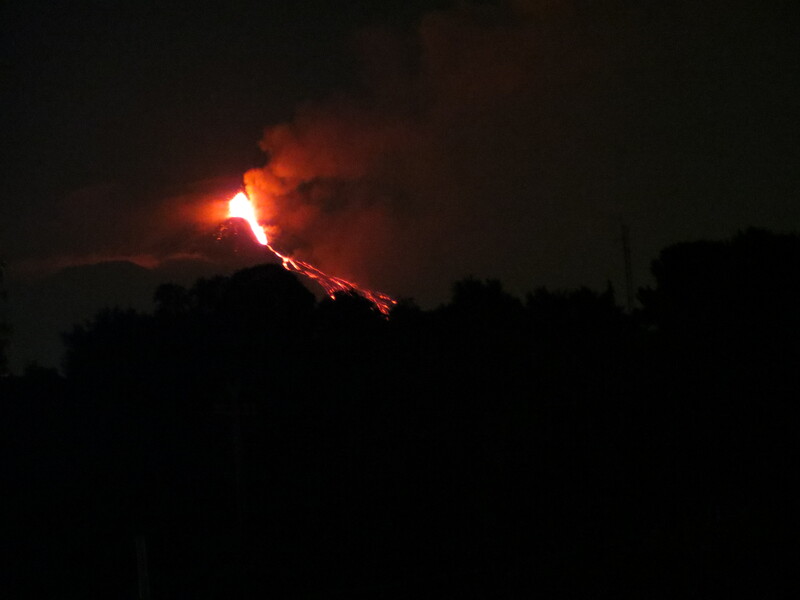 In fact, she is still erupting. Our in-laws called us as they have a great view of the top of Etna from their house and we drove straight over there. A block of flats annoyingly blocks the view from our place, go up or down the hill a bit and you can see her clearly. Huge rivers of lava streamed down her side and into the Valle del Bove, an expansive valley on the volcano which contains the lava flow and naturally protects the villages below. 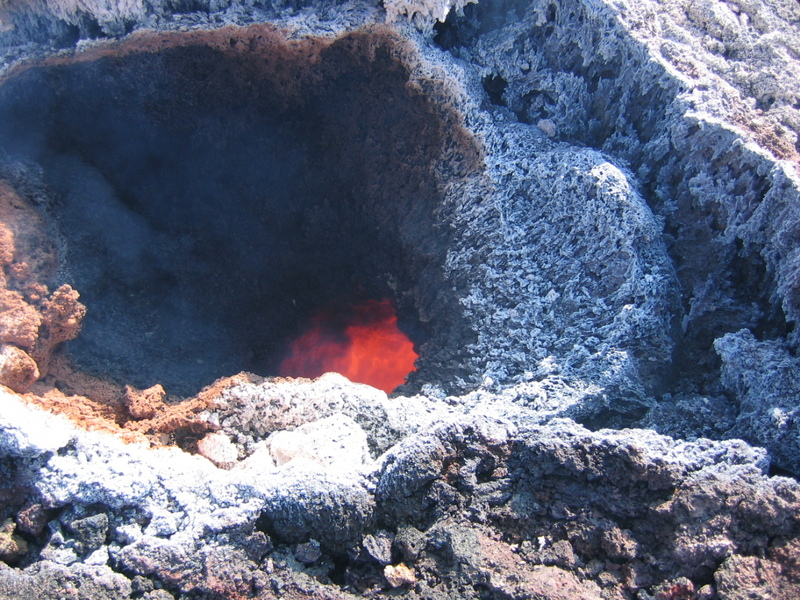 It seems to be bottomless holding the lava from eruption after eruption but it is going to have to fill up one day, surely? We watched, transfixed as lava, gases and rocks shot up into the air again and again reaching what seemed from below, astonishing heights. We thought about driving a bit further up the mountain to get even closer but decided we were both too tired and that we would do that another night, we could see the flashes of cameras high up the volcano. I am not sure how long we sat there eating ice-cream whilst watching her erupt but we saw her again last night and she was still going strong. It is difficult to tear your eyes away from an eruption.